It’s spooky szn, y’all. This Halloweek, you’re sure to see the good, the bad and the ugly. We want you to be the safe. Read on for some tips on enjoying your Halloween celebrations and staying safe at the same time — because, yes, it’s possible, and yes, it’s important. Some college towns are known for their Halloween celebrations. Bar events and fraternity parties, as well as special concerts, make for a big night every year. This attracts visitors of all ages and from many places, both to partake in the fun and to observe the spectacle. It’s a huge night and it’s a ton of fun, but large masses of foreign faces and out of town visitors can make for a hectic time. It is more important than ever to stay connected with your friends on nights like this. Establish a game plan before going out. This is a great pregame topic and helps you to keep track of where your people are, where they are going next, and where they might be if you lose track of them. Make sure to check in frequently. Try to stick together or keep a buddy with you when you’re out. Even if you lose track of some friends, at least no one is totally isolated. (Safety in numbers is a classic but time-tested tip.) Touch base with people you do lose track of and make sure everyone is comfortable, safe, and not alone. Status updates on the app make this part easy. 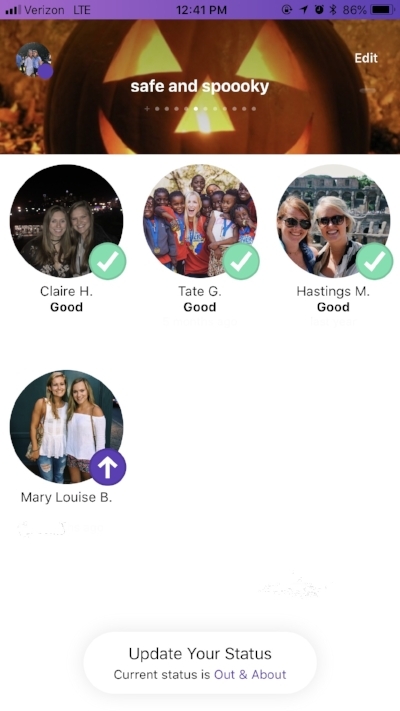 Check your grooops for your friends’ status updates, pay attention to your notifications, and update your own status (if it doesn’t change automatically when you move from places that aren’t marked as safe zones). Staying up to date helps you to ensure no one is put in an uncomfortable situation or is unaccounted for at any point during the night. A few final points. Many cities have cracked down on people wearing masks and most parties require guest lists and tickets or wristbands to reduce the number of unknown or random attendees. These measures go a long way, but be sure to stay on your guard around people you do not know. It’s a long night — pace yourself! Have fun, get spooky, and #staysafe.